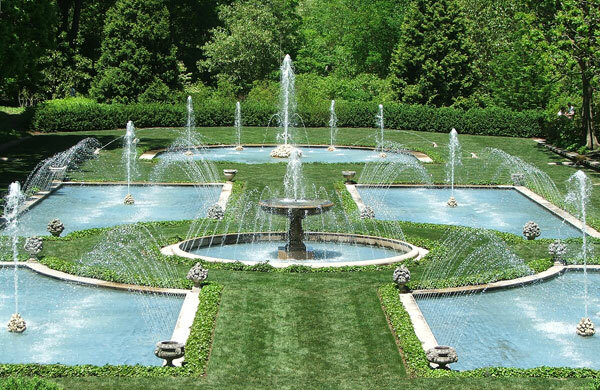 Longwood Gardens are near Philadelphia, Pennsylvania, and should be on the serious Botanical Gardens tourist's trail. Visitors of the 'big (and old) is best' persuasion will definitely have fun. Longwood has wide paths, perfect for scooting seniors, or families strolling out on Mothers' Day. Gardeners with an emotional bent will have a whimsy-free, impersonal wander. But there's history here - and money - and good pamphlets to read all about the combination. 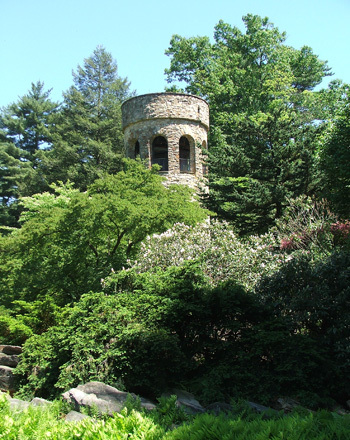 Longwood has garden rooms created in 1903, tall trees each equipped with a lightning rod, fields and fountains, a large conservatory - much to see. Small areas, taken out of the larger context of the gardens, are quite magical. 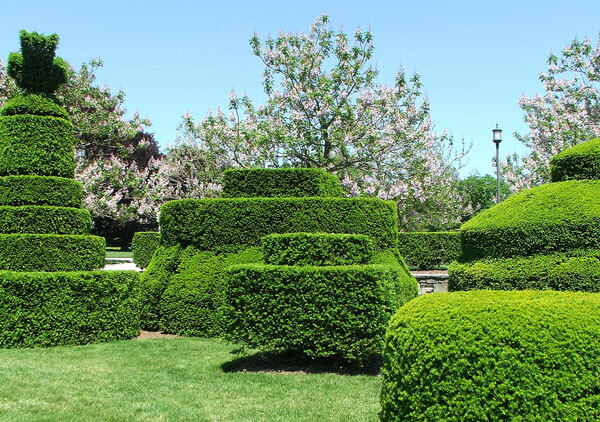 I liked the topiary lawn, which I saw in late spring, when the leafage (and the trim) was fresh and green. I giggled at the fatness of the shapes, and the interesting shadows from the sparkling sun. On the plant level there was much for an out-of-season visitor to photograph. 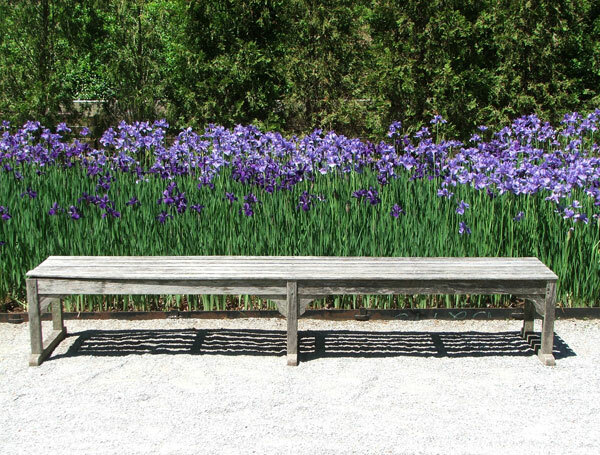 One garden room was full of flowering irises, another had a collection of pruned and shaped Wisterias, just past flowering. Longwood's pamphlet promised more than 100,000 tulips in a rainbow of colour in the Flower Garden Walk. Blast! I just missed them. I looked at the water features - ponds, large fountains, a small dancing Italian Water Garden, and a person-made waterfall (ouch). And the wildlife - fat tadpoles bouncing in the pond, bullfrogs (new to me) on the edges roaring. And the 'tamelife' - lots of busy gardeners. There were many gardeners dotted throughout the gardens, of various shapes and sizes. At least three were bending over weeding the Tiarella ground cover, another was carefully sweeping the path behind the main fountain, three were weeding the Pachysandra ground cover, and a team of at least seven were planting out the summer displays. 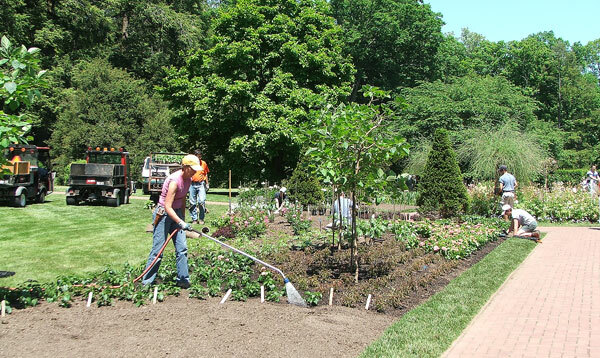 Longwood puts on lots of events, from fountain and fireworks festivals to bonsai clinics. It's in the botanical entertainment business, as well as providing horticultural education and adventures.